16 pp. Roman, 208 pp. Mwera is a language of Tanzania that is spoken in the south-eastern regions of Lindi and Mtwara, north of the Makonde area, and mainly in Nachingwea, Ruangwa and in rural districts. It is a language of the Yao cluster which belongs to the Bantu languages (Niger-Congo language family). According to Guthrie, Mwera receives the numerical assignment P.22, and the number of speakers comes to 469.000 people (estimation of 2001). Mwera is used for face-to-face communication by all generations. However, not much research has been done so far for the language and the culture. The dictionary is the only one of its kind. 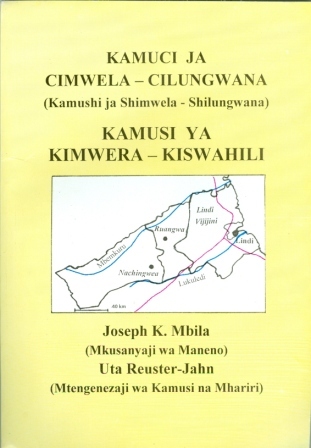 On 208 pages, it provides comprehensive translations in an alphabetical order from Mwera into Swahili. The dictionary comprises more than 4,500 entries that were examined by the native-speaking Tanzanian co-author. It contains many plant terms and technical terms that are used for the agricultural economic system of the Mwera.